He was Amsterdam’s Painting Painter. During the day he and his younger brother Jimmy could be found in houses all over the Rug City, painting them inside and out. At night and on weekends he’d switch his cans of house paint for an artist’s palette full of oils or water colors and create lovely scenes and landscapes that still today hang on the walls of many homes in this community and beyond. 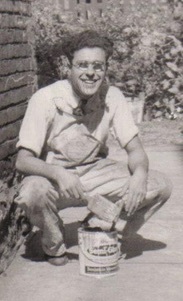 Anthony “Tony” Ciccarino was born in Amsterdam on October 21, 1913 to his parents Vincenzo and Assunta. He and his brother started painting together when they were vey young and quickly gained a reputation for being meticulous, reliable and trustworthy. In addition to exterior and interior house painting, they were also expert wallpaper hangers. Born and raised on the West End, the brothers moved to a duplex home on McClellan that had a huge garage, which was perfect for storing the tools and equipment of their trade. Their Ciccarino Brothers van became a familiar site around town. You can read the rest of my story about this Amsterdam painter in my new book “A Year’s Worth of Amsterdam Birthdays.” To order your copy, click here. Knew him well. Went to school with Janet and Elaine Ciccarino.